This is a great recipe to impress a crowd at your next party or impromptu gathering. 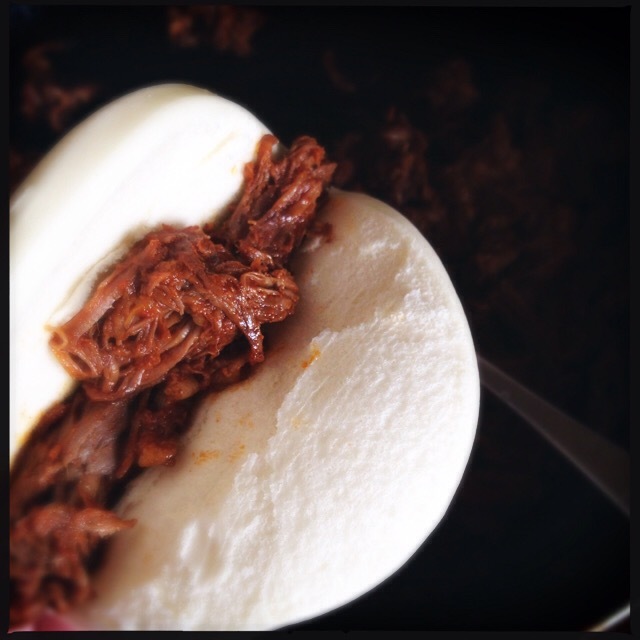 It uses a Taiwanese-style bun with pre-cooked Mexican-style slow-cooked beef, and the slaw — which is more like a salsa when it’s ready — makes it a perfectly rounded snack or appetizer. Barbacoa is traditionally made with slow-cooked beef head, and although the name and the low-and-slow style might make some Americans think of BBQ beef or pulled beef, the taste of Barbacoa is more akin to a slow-cooked beef stew with vegetables. The pre-cooked barbacoa from Del Real Foods (which is perfect for a quick snack like this) has great flavor but no spicy heat, but you can spice up the final version of your tacos later. For most brands, like the one I purchased, they are already fully cooked and split in half, and are prepared by simply removing them from the package and microwaving them for about 45 seconds. You can also just let them thaw out for about 20 minutes. First, prepare the slaw, which is sort of a fresh variation on curtido. 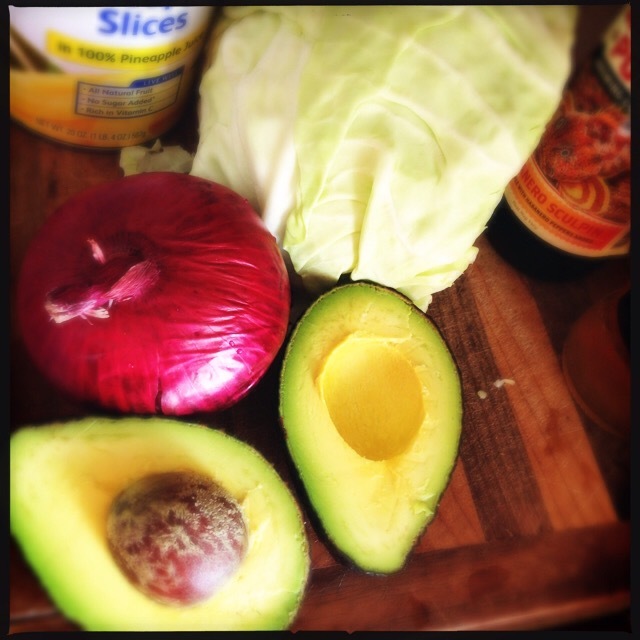 Chop half of the onion (leave the other half for garnish), and 1 1/2 avocados (save half of one for garnish, too). 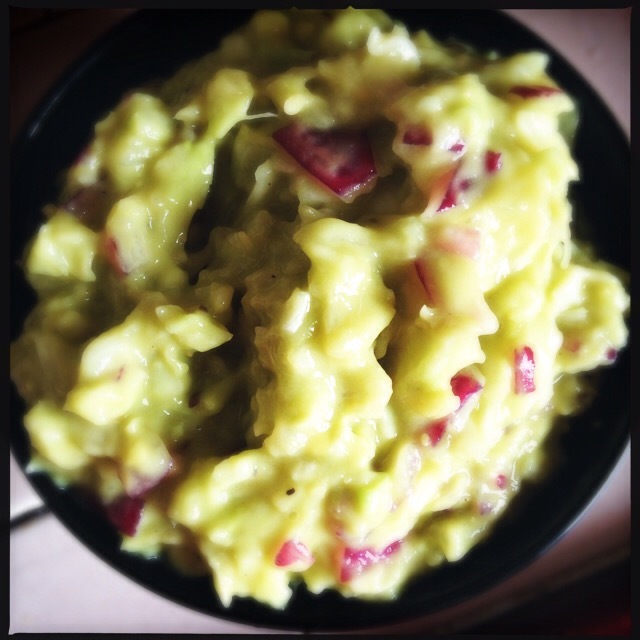 Then chop the pineapple slices and place the chopped onion, cabbage, avocado and pineapple in a large mixing bowl. Add the pineapple juice from the can, plus the vinegar, salt, pepper, and oregano. 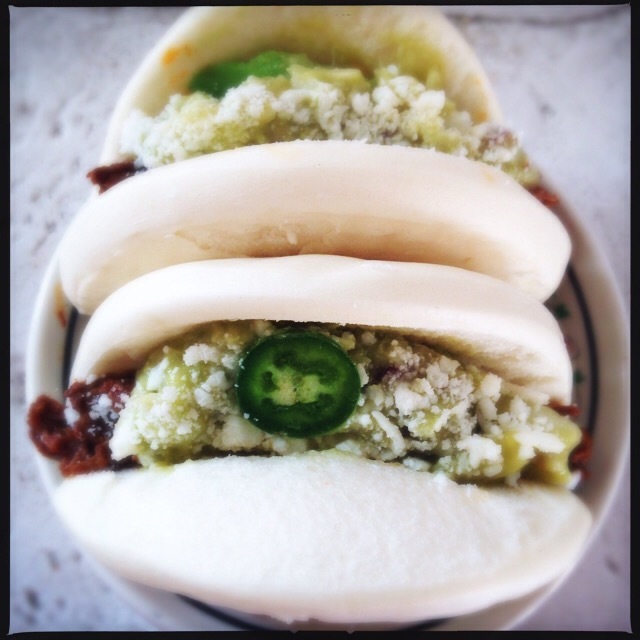 If you’re going to add the jalapeno, dice it and add it now. If you’re serving a crowd with varying tastes, it might be best to cut the jalapeno into larger slices and add it as a garnish when you assemble the tacos, so people who don’t like the extra heat can just remove the pepper. Blend all of the slaw ingredients thoroughly (use a food processor or a vegetable chopper) and set aside. You can prepare the slaw up to three hours ahead of time — just not too much longer, or else your avocados might color a little. This last step of blending the slaw in your food processor might not seem worth it, but trust me, it is. 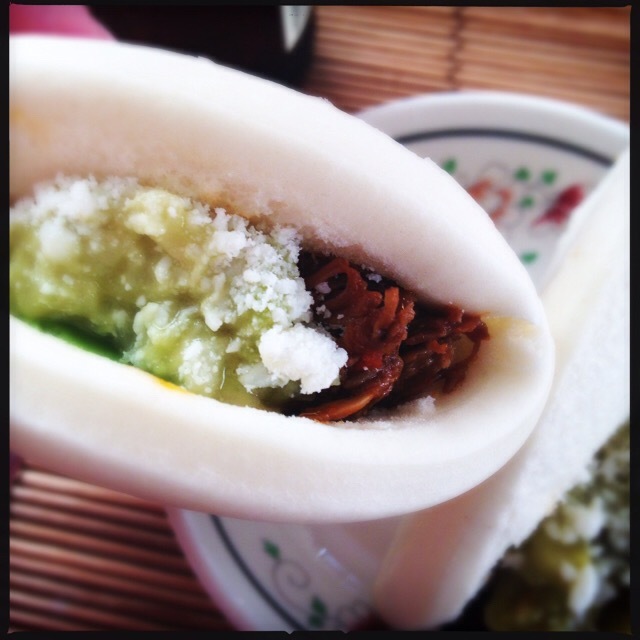 This way the bits of pineapple, onion, avocado and cabbage will adhere to the meat and the bun, instead of falling out. 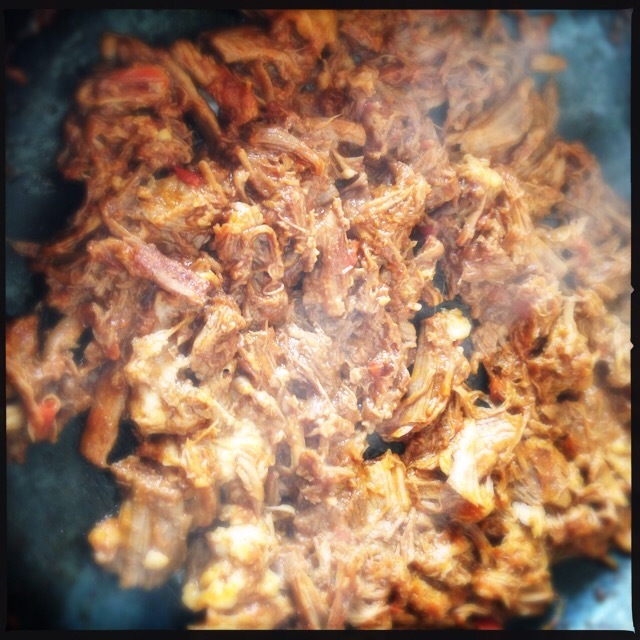 Put the barbacoa in a saucepan over high heat and let cook briskly for about 8-10 minutes, or until the sauce has thickened and evaporated. Be sure to break up any big chunks of meat. This will concentrate the flavor as well as giving the meat a nice sauce for your tacos. 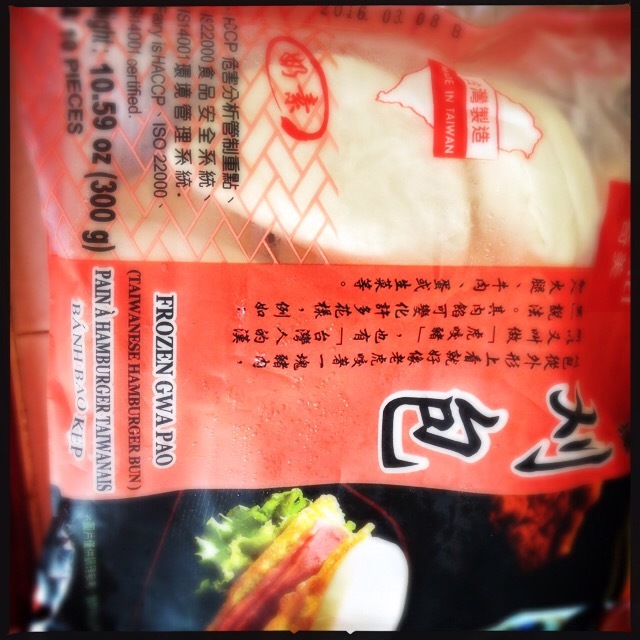 Prepare the bao buns last — check the package, but more than likely, they are ready in the microwave in less than a minute, so obviously they need to be ready last. 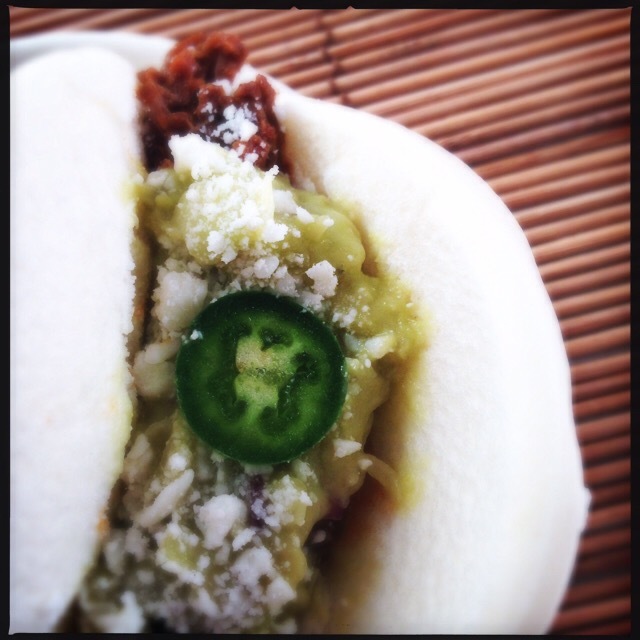 Fill each bun with meat first, then add the slaw, cotija cheese and other jalapeno, onion or avocado. 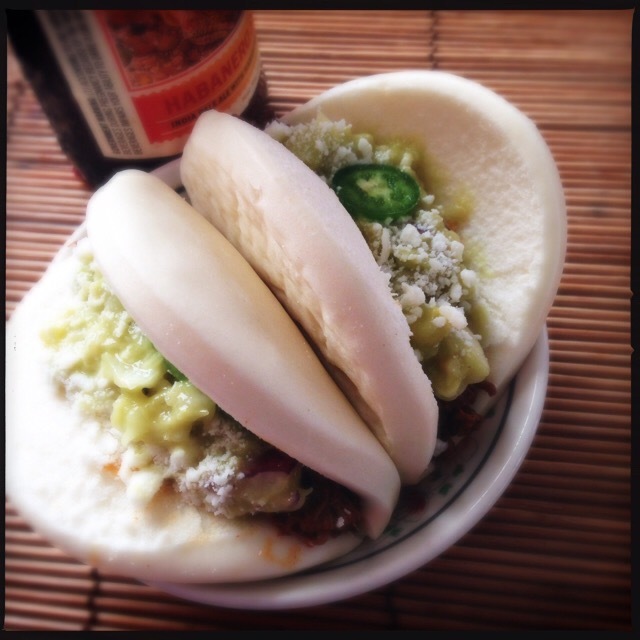 This entry was posted in burgers, condiments, cooking, food, holidays, side dishes, snacks, Uncategorized and tagged avocado-pineapple slaw, bao bun tacos, barbacoa, barbacoa beef taco, Del Real Foods, Del Real Foods Recipe Challenge 2015, fruity salsa, fruity slaw, fusion tacos, gwa bao, gwa pao, Mexican/Thai fusion food, taco toppings. Bookmark the permalink.